A modern 'A rated' compact fluorescent lamp ideal for a huge range of applications where a good level of light is required with low energy consumption. 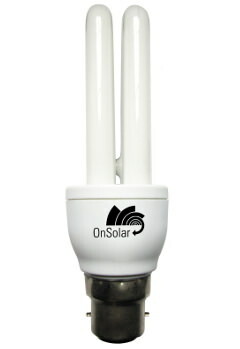 The 11W CFL provides a very useful light source which is a near equivalent to a regular 60W domestic incandescent lamp. 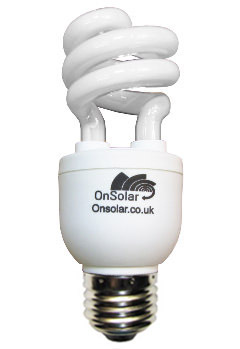 A powerful 11 WATT Compact Fluorescent lamp suitable for many lighting applications using a 12v DC power supply. Ideal for areas requiring power efficient lighting such as: Remote Workshops, Marine and 'off grid' Solar powered homes, Caravans and remote locations such as Farm buildings, Barns and Stables and portable camping lamps. 11w Lamps are available in 'ES / E27' Edison Screw & 'B22' Bayonet base fitting. SAFETY 1ST... Please ensure the correct rating of cabling is used throughout when installing DC circuits. Long cable runs may require high grade, high amperage cables in order to prevent excessive voltage loss, especially when using multiple lamps on the same circuit. All circuits should be fitted with a suitably rated safety fuse in order to prevent fire in the event of short circuit. Use of proprietary lamp fittings is recommended wherever possible to protect and prevent the ingress of insects and damp where lamps may be exposed in external / exterior light fittings. 12v 'AC' transformers or any kind of adaptor/ transformer which does not produce pure DC power must not be used. If using a DC regulated transformer, please ensure that it has enough power reserve for your application. For any remote application, we recommend the use of Lead Acid or other quality rechargeable batteries and / or using a solar 'PV' panel amp;& regulator to replenish power as necessary. All of our CFL Lamps are now sold out. Please accept our apologies for any inconvenience caused whilst we finalise the replacement product. A new range of LED lamps will be released as replacements in due course.